Prepare 9-inch spring-form pan by wrapping outside of pan tightly with 3 layers of heavy-duty foil. Using paddle attachment on an electric mixer, beat cream cheese, mascarpone, sour cream, and sugar until smooth. Add flour and salt. Add eggs and egg yolks, one at a time, beating until incorporated after each addition; use a spatula to scrape down the sides of the bowl in between additions. Gently mix in fresh herbs, lemon juice, lemon zest, and black pepper. Pour batter into prepared spring-form pan. Place pan into large roasting pan; add enough hot water to roasting pan to come halfway up sides of spring-form pan. Bake cheesecake until set, but center moves very slightly when pan is gently shaken, about 2 hours. Turn off oven and crack oven door open to allow cheesecake to cool, about 1 hour. Remove cake from oven and from roasting pan; cool 1 more hour at room temperature. Refrigerate uncovered overnight. Can be prepared 4 days ahead. Cover and keep refrigerated. Combine sugar and cornstarch in a small saucepan over medium-high heat. Whisk in mandarin orange juice, stirring until any clumps of the cornstarch are dissolved. Cook for 5 minutes, stirring occasionally to assess the thickness of the glaze. Remove from heat and let sit. 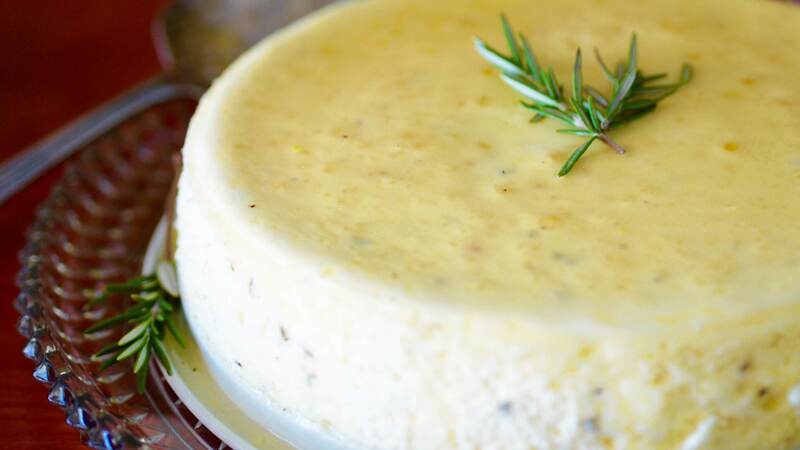 Pour glaze over the chilled cheesecake. Garnish with fresh rosemary sprigs.